Since 1943, the gallantry of animals in war has been honoured through the PDSA Dickin Medal, recognised as the animals’ Victoria Cross. Today, it forms part of the world’s most prestigious animal awards programme run by PDSA. This helps us fulfil a key element of our founder, Maria Dickin’s, vision: to raise the status of animals in society. Illustrious recipients over the years include pigeons that carried vital messages from behind enemy lines in World War II; dogs that located casualties among the rubble during the Blitz and military working dogs that detected bombs and missiles during more recent conflicts. To mark the centenary of the outbreak of World War I, PDSA wanted to ensure that the contributions of all animals that served were duly honoured and recognised. Warrior’s incredible story epitomises that contribution and he has been awarded the first Honorary PDSA Dickin Medal. 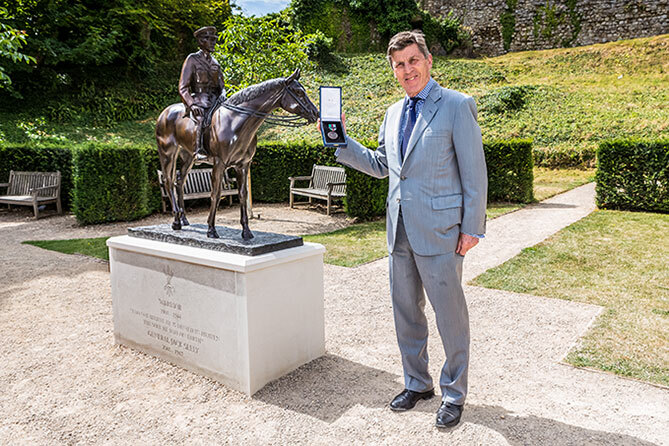 In backdating this award to Warrior, PDSA wishes to ensure that the gallantry of not only this outstanding horse is recognised, but that it serves as a representation and honour of all the animals that served in the Great War. Warrior displayed gallantry above and beyond the call of duty and was an inspiration to soldiers as they faced their greatest fears against bayonet, bullets, gas and tanks. His truly remarkable story, as documented so wonderfully in the book, is inspiring and heart-warming. PDSA is UK’s leading veterinary charity. With 51 pet hospitals providing vital care for over 470,000 pets each year, there is no other charity comparable to PDSA in terms of the scale and impact we have. . PDSA has been a lifeline for millions of sick and injured pets for 97 years – having provided 100 million free treatments to more than 20 million pets in that time. Not many stories told at a mother’s knee make it to the wider stage. Especially if, like that of Warriorin our family, the tale was once renowned but then swallowed beneath the incoming tides of time. Yet Warrior now rides again thanks to PDSA, 100 years since he and Jack Seely, my grandfather, went to France with little certainty of a safe return. For this was the wildest fiction made amazing fact; how Warrior spent his whole life within sight of the sea on the western coast of the Isle of Wight except for a not inconsequential four-year interlude when he and Seely went to France in 1914. There they defied bomb, bullet and every meaningful survival statistic to return in glory at the end of 1918. Warrior’s greatness went beyond survival; it continued when he won at the Isle of Wight point-to-point, four years from the day that he and Jack Seely led a famous cavalry charge near Amiens at Moreuil Wood in March 1918. His greatness was also in the simple, uplifting, heroism of having faced danger without flinching and never having let fear take the reins. That same heroism was shown by the hundreds of thousands of horses and mules that were not blessed with Warrior’s outrageous slice of fortune for survival. 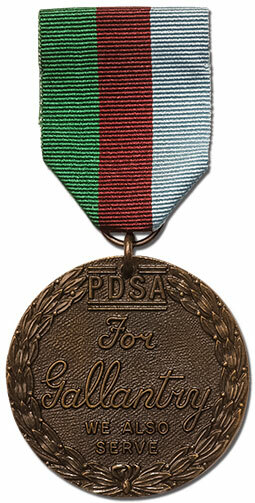 So imagine our family pride and gratitude at the posthumous granting of the first Honorary PDSA Dickin Medal; on behalf of all animals that served in World War I. For Warrior’s story was lost. PDSA‘s recognition shows that it has been found again. We are more than honoured: thinking of all those other animals that also served, we are truly humbled.